The Denver Nuggets had been rumored to be among the most active teams involved in trade talks this season and yet they only made one small deal. 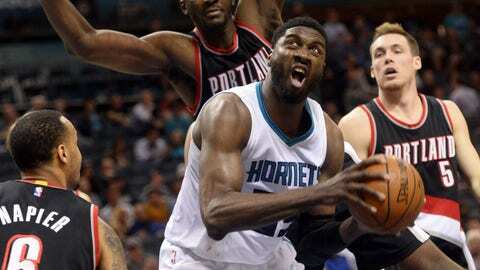 How will Roy Hibbert make an impact? The Denver Nuggets consummated their second trade in as many weeks by acquiring veteran center Roy Hibbert from the Milwaukee Bucks in a trade deadline deal. Hibbert joins the Nuggets after splitting time between Milwaukee and Charlotte this season, averaging 5.2 points and 3.6 rebounds in 16 minutes per game in 2016-17. Chris Dempsey of Altitude TV reports that Hibbert will remain with the team, filling the last slot on the Nuggets 15-man roster after Johnny O’Bryant’s second 10-day contract recently expired. Denver will send Milwaukee a 2019 second-round pick — one that is top-55 protected — to complete the deal. Hibbert, a nine-year NBA veteran, is most known for his time in Indiana, where he was a core member of a Pacers squad that made it to two consecutive Eastern Conference Finals. However, the two-time All-Star has seen a major drop-off in production since being dealt to the Lakers at the end of the 2014-15 season, battling ongoing knee issues. There are two motivating factors behind this deal for Denver — it helps financially and it gives them more bodies to go against the Pelicans’ new-look frontcourt. The Nuggets are currently 1.5 games ahead in the race for the Western Conference’s eighth playoff spot. Trailing them, is a pool of teams made up of the Kings, Trail Blazers, Pelicans and Mavericks. Having just dealt their franchise player, it makes sense that the Kings will soon drop down the standings, as may the Mavericks, who traded away Andrew Bogut and released Deron Williams at the trade deadline. Portland is quietly having a bad month, going just 1-5 in February, and are in danger of falling behind the pack. This leaves New Orleans as the most plausible and dangerous threat to take eighth place from Denver. The Pelicans are currently 2.5 games back of Denver heading into the final two months of the regular season and the teams are set to play each other three more times. New Orleans will travel to the Pepsi Center twice, while Denver will make the trip to New Orleans once in April. These games may have the power to decide which team makes the playoffs and which team finds themselves sitting at home once again. Roy Hibbert offers Denver a legitimate big man to counter the Pelicans superstar duo. With the recent addition of Mason Plumlee from Portland, the Nuggets now have Nikola Jokic, Darrell Arthur, Kenneth Faried, Plumlee and Hibbert to battle against Anthony Davis and DeMarcus Cousins down low. The other aspect of this deal for Denver is that it helps the team financially. Before the trade, the Nuggets wereapproximately $7 million below the league’s salary floor. Taking on Hibbert’s one-year, $5 millioncontract gets the team much closer to the floor, something that general manager Tim Connelly has been actively trying to do this season. The Nuggets traded for, then waived, veteran guard Mo Williams in order to add his $2.2 million contract to the books this year. Denver were said to be one of the more active teams involved in trade talks as the deadline closed in. Rumors were swirling around veteran wings Danilo Gallinari and Wilson Chandler; however, after the dust settled, the Nuggets stood pat and made one small, but potentially, efficient trade.